Learn how to connect a wireless or wired controller to your Xbox 360 console. Press and hold the Guide button on the controller until it turns on. The lights around the console's power button will stop flashing once the controller connects to the console. 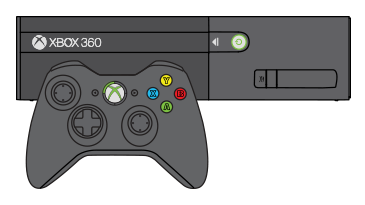 On the Xbox 360 S console, connected controllers have one of four positions. Each position appears as a lighted section around the console power button and the controller Guide button. On the 360 E console, a solid green light on the front of the console shows that the controller is connected. To see the player position, look at the ring of light around the Guide button on your controller. If the controller doesn't turn on, check the batteries. Insert fresh AA batteries into the battery case and make sure you place them correctly. You can also use the Xbox 360 Play & Charge Kit or the Xbox 360 Quick Charge Kit to power the controller. Learn more about Xbox controllers and chargers. To connect more controllers, follow these steps again. You can connect up to four controllers. Each connected controller appears as a lighted section around the console’s power button and around the Guide button in the middle of each controller. To disconnect a wireless controller, press and hold the Guide button for three seconds, and then choose to turn the controller off. When you turn off the console, the controller will reconnect the next time you turn on the console. The controller can be connected to one console at a time. You can connect the controller to a different console, but the controller will lose the connection to the previously connected console. Plug the Xbox 360 Wired Controller into one of the two USB ports on the front of the Xbox 360 console. To disconnect the controller, pull on the connector, not the cable. The cable on the Xbox 360 Wired Controller features an inline release. 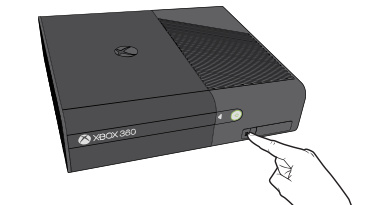 If someone pulls the cable, the inline release reduces the chance of the Xbox 360 console falling. If your wireless controller disconnects or can't connect to your console, see Xbox 360 Wireless Controller disconnects or can't connect. Insert a new set of AA alkaline batteries into the Xbox 360 Wireless Controller, and then try to turn it on. If you have another Xbox 360 Wireless Controller, take the battery pack from that controller and attach it to your controller. Then, try turning on your controller. If it works with the different battery pack, your original battery pack might be defective. If your controller is under warranty, you can order a replacement battery pack from Xbox Support. For more information, see the Contact Us section at the bottom of this page. If your controller is out of warranty, you can buy a new battery pack from a retail store. If you or a friend has an Xbox 360 Rechargeable Battery Pack, attach that battery pack to your controller. If your controller works with the rechargeable battery pack attached, you can buy a new battery pack from a retail store or order a replacement from Xbox Support. For more information, see the Contact Us section at the bottom of this page. Would you like to contact Support regarding the "Connect a controller to your Xbox 360" issue you were reading about or a different issue?